A classic beauty with a keen eye for luxurious style. Fashion trailblazer Olivia Vincent shares her new-look store and love of British designers with editor Trudi Brewer. Fashion is Olivia Vincent's calling. From retail to PR and now owning one of Auckland's most luxurious boutiques - MUSE her brand is on a roll. 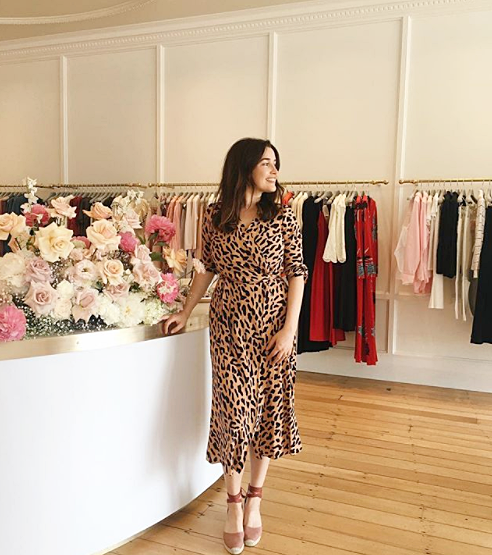 With labels from New York, London, Paris and Milan, Vincent shares her career highs, fashion and beauty weakness, along with her most recent labour of love a second store on Auckland's Ponsonby road. Vincent in her new Ponsonby store. How did you become the owner of Muse? I bought the store from my mother-in-law and her business partner, after twenty years of their ownership. What made you want to buy a fashion store? I’ve worked in retail since I was a teenager. Every store I worked in I was always the top salesperson. I love styling clients and working one-on-one, helping them to find the perfect fashion piece. I then worked in branding and PR (in the fashion industry), so it was a natural progression to combine all those skills and purchase a boutique. Every day is different - I love that they are so varied and I never do the same thing. A typical day usually starts with the store styling clients, going through next season’s collections and placing orders or talking with the team about what’s coming soon and how it’s going to fit in with our current offering. I’m always thinking about and working on social media – it’s one of the best ways we talk to our clients. In the evenings, I’m catching up on emails. Why did you open in Ponsonby? I have always wanted to open a store in Ponsonby, and this was the only site I wanted on Ponsonby Road (corner of Tole street and Ponsonby Road). It had to have the elegant, boutique feel and this shop was perfect. I have such a great personal relationship with our clients, who have become friends. Also, the buying process for the store has become a fun, collaborative process for the entire team. Having lived in London for a few years, I’m partial to British designers. I love Stella McCartney, M.I.H Jeans, and Vivienne Westwood. Buying MUSE Boutique - I’m so glad I did it. An edit of DVF, Victoria Beckham, Tibi, Cecilie Copenhagen, M.I.H Jeans, Missoni, Muse Cashmere, Georgia Alice, Celiné Eyewear, Majestic and Self-Portrait to name a few. As a retail store, how do you stay relevant to the world of online shopping at our fingertips? We have an online store, our Teed Street space and soon a second Auckland store, they all complement each other. Someone might pop into the store after seeing something on the website they liked and want to try in person, or vice versa. Personally, I prefer to shop in a store. You can't touch the fabric online, as you can in store, or see how it sits on the body until you try it on. Social media helps us stay relevant and it's the ideal way to chat with our clients, share what’s new in store, and how we style our favourite new season pieces. Sophia Loren, Jackie Kennedy Onassis and Cher Horowitz from Clueless. What will be your investment buy this spring? I have just bought a classic pair of Celine slides - I love. They’re so comfortable. I’ll be wearing them every day once the weather warms up. Who are your favourite local and international designers? Locally Georgia Alice and I like lots of Maggie Marilyn at the moment. Internationally, DVF, Stella McCartney, Tibi, and Chanel. What handbag will you carry this season? My vintage Chanel bag. It’s a classic – I’ll be wearing it for many seasons to come. Shoes. I have a shoe addiction - that is possibly unhealthy. It’s a little bit of luxury, every day. I enjoy my skincare routine; it’s my way of de-stressing after a busy day. What is your one beauty indulgence?